Extreame Savings Item! Free Shipping Included! 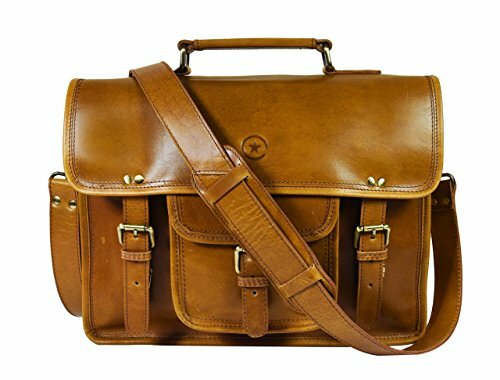 Save 41% on the 15” Vintage Handmade Leather Messenger Satchel Bag | Briefcase Bag By Aaron Leather by Aaron Leather at Mas Fashion. Hurry! Limited time offer. Offer valid only while supplies last. **STYLISH AND ELEGANT - A Unique, Eye-catching Rugged Vintage Look Messenger Bag That Is Solid, Sturdy And Reliable | Looks High End With Casual And Formal Attire | Great For Students, Business Or Travelers Who Want To Make A Fashion Statement. **DIMENSIONS - 15"(Length) x 11"(Height) x 4"(Depth) | Adjustable Strap With Max Length 55"
**PERFECT GIFT- A Wise And Thoughtful Gift For Active Students & Professionals.